I received a free stamp at convention. It’s one of the single stamps and is called Love Who You Are. I hadn’t used it yet, and I thought it would work well with this sketch. You see those pretty orange sequins? They’re a sneak peek of something that will be included in an upcoming My Paper Pumpkin kit. 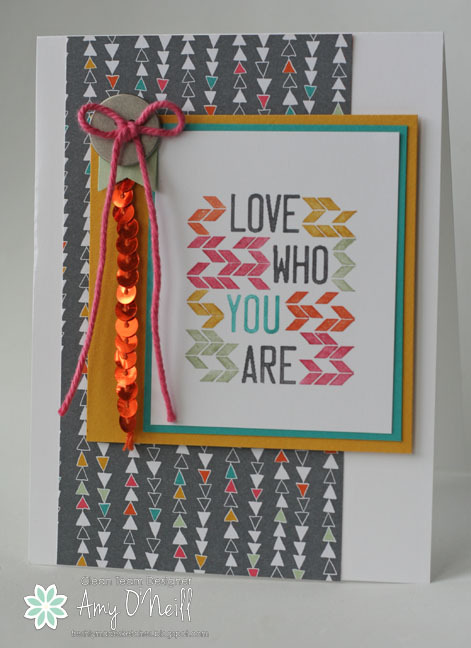 The dsp is from the Confetti Celebration pack, and I thought the geometric pattern matched the stamp so well. I think I need a little help with the sentiment on this stamp though. I have puzzled over exactly what it means. It reminds me a little bit of a cognitive optical illusion. When you look at this picture, what do you see? Do you see a duck or do you see a bunny? I can see both (I saw the duck first though, how about you?). Well, I kinda feel this way about the sentiment in this stamp. I can’t decide if it’s a command — it’s telling someone that they should love who they are, or is it saying (I) love who you are? Sometimes I interpret it one way and sometimes I interpret it the other. Help me out! What do you think? On to more important matters — we have a guest designer this month! The fabulous Kim Singdahlsen will be with us for the month of August. I always love everything she makes, and I’m thrilled to have her on board with us. Be sure to stop by the Freshly Made Sketches site and give her some love. 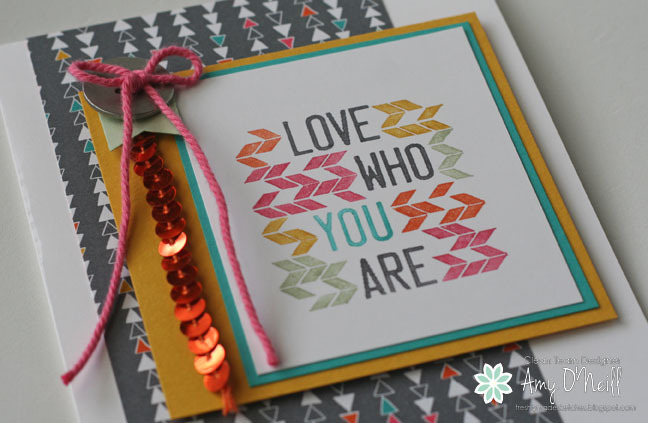 And please play along with us this week and post your card in the gallery! We love seeing what you make.